What is it I need to know before booking a tour? Where do I go to book a trip? If I want to explore the island and the monastery, what trip should I be booking? When can I land on the Island? What price is the Landing Tour? Where can I find details of all the different boats? What are the odds of me getting on the island? If they can’t land on the day I’m scheduled, can I move my booking to the day after? I’ve heard the boats are all booked out until September? Is that true? 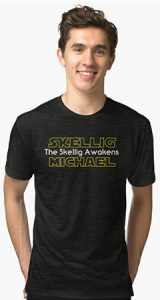 Should I visit Skellig Michael if I have a fear of heights? I really want to get to see the puffins when should I book? What is a Skellig Islands Eco Boat Tour (Non-Landing)? For a Landing Tour, where you get to explore the island and the monastery, go to our Skellig Michael Boat Tour Booking page and book all available operators. You can also book a Skellig Islands Boat Tour (Non-Landing) which brings you right up close and around the islands as well as showing you our beautiful coastline and amazing marine and bird life. The Skellig Michael Landing Boat Tour. Landing tours bring you out to Skellig Michael and give you between 2 and 2 and a half hours to explore the island. These are, by far, the most popular tours. Accordingly, they can be difficult to secure. So book well in advance. The 2019 season begins on May 18th and continues through until September 30th. For updates on this, either follow our Twitter account, our Instagram or join our mailing list. Prices for the 2019 season landing tour cost between 90 euros and 125 euros per person, with some operators charging booking fees on top of that. Unfortunately, due to overwhelming demand and the shortness of the season, there is no discount price available for children taking the landing tour. Many boats offer discount fares for children doing Eco Tours, however. Check out our List of All Available Skellig Michael Boat Trip Operators. This is current as of the 2017 and 2018 seasons. Good but not guaranteed. Landing on the island itself is very weather-dependent. The main factor is calmness at the landing jetty on the island. If the ocean swell is too large, it’s not safe to disembark. Sometimes, this can occur even when it’s a very fine day and the sea looks calm on the shore. In a typical season, boats land on the island about 100 out of 130 possible landing days. So, even if you have a booking, a landing is never guaranteed. In general, no. Because, depending on the time of year, the boat is generally booked out for the next day as well with another set of passengers. But there are always exceptions. Boatmen will do everything in their power to get you out. And this is especially so if you’ve booked with a local accommodation provider such as the Moorings or one of the guesthouses or B & B’s who have relationships with the boatmen. Miracles do happen. Arriving at the pontoon in Portmagee at 8 am on the expectation that there may be some cancellations that day. Approximately 180 people land on the island each day. Of these, a certain percentage may not be able to make the trip as expected. Secondly, and the best route overall, in our experience, is to book in with a local accommodation provider like The Moorings, which has long-standing relationships with the boatmen. There is an effort underway to retain a certain amount of seats that are kept for guests that are staying in the area. Check out our Accommodation section for more details. This is tough to call but probably not. There are a number of very scary drops bordering the paths at times. People have fallen and died on the island so it’s not just irrational phobia at work either. You could land and stay on the path leading up to the steps and just drink in the majesty of the island from there. And some people choose to do that. But it’s a lot of expense and effort for only a fraction of the overall experience. Puffins are generally present in smaller numbers on the island from when the island opens in May. But their traditional departure date is in and around August 7th. We would advise planning your trip at least a few days to a week before then to ensure you get to see them. They are the icing on the cake. The cake is still great without them but the puffins are rightfully famous for being adorable inhabitants of the island. If you can’t secure a landing tour on the island, are extremely afraid of heights or wish to spend less money, then a Skellig Islands Boat Tour is a great substitute. The boat trips takes right up close to Skellig Michael and the second largest gannet sanctuary in Europe, Small Skellig. You also get to explore some of Ireland’s best scenery in South West Kerry’s spectacular coastline. Not to mention you often see wildlife such as dolphins, seals, whales and various bird life, including puffins. Typically, the price is 40 euros per person. For regular Skellig-related news and content, follow us on Twitter and Instagram.